Women may experience weak muscles as a consequence of many different conditions. If you are faced with feelings of bodily fatigue, it could be helpful to try to evaluate any other symptoms you might be experiencing in order to determine what the root cause might be. 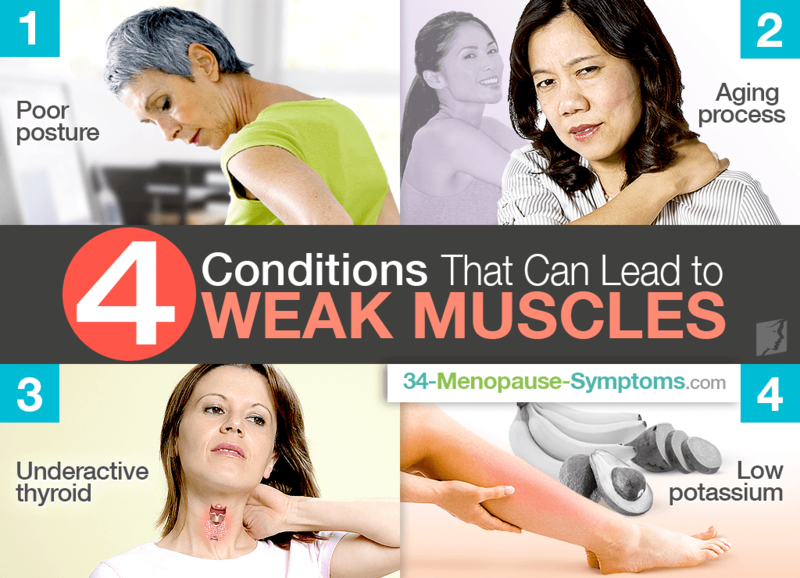 Below are four of the most commonly-seen conditions known to affect women, which often lead to muscular weakness. Awareness of these might be helpful for you to better understand the situation. If we are honest with ourselves, most of us are guilty of not exercising our muscles as often as we should. If this is the case for a large proportion of time, these bad habits can cause problems later on in life. Having weakened muscles is just one of the problems that is likely to arise if you don't practice good posture, which can also lead to back pain and deterioration of joints. Unfortunately, some muscle deterioration is one of the many changes you will encounter as you get older. The majority of women notice a loss of flexibility and lower energy in general, which leads to their feeling like their muscles are weaker. When a woman reaches her forties, she will begin to lose some muscle tissue, some of which will naturally be replaced with tough, fibrous tissue. These changes cause the muscles to become harder to contract and more difficult to maintain in spite of exercise. This condition - medically identified as hypothyroidism - happens when your thyroid gland does not produce enough hormones, which can occur if the gland becomes damaged. Among symptoms of this condition are aching and cramping muscles, as well as weakness. Hypothyroidism can be difficult to recognize, given that its symptoms are so similar to many other conditions; because of this, many people don't realize they are suffering from it for many years. There can be different reasons for low potassium levels, relating to both permanent and temporary factors. Eating disorders, excessive sweating, and kidney disease can all lead to this condition, as can certain medications, such as antibiotics and diuretics. Potassium is an electrolyte that is required by the body to maintain muscle functionality. Without it, muscles are prone to spasm and cramp, and they can also become weak. Weak muscles can be an effect of a number of different diseases and conditions. In order to identify the cause of your specific problem, it can be helpful to consider some of the most commonly-seen conditions. If you are concerned about the severity of weakened muscles, or are suffering from additional, difficult symptoms, you should discuss your situation with your doctor for medical advice.